Teach .b course is a 4-day training course which prepares participants who have met the prerequisites to teach the 10-lesson .b curriculum to 11-18-year-olds in schools, or other educational or youth-related organisations. Participants will be taught the lessons in ‘real time’ with opportunities to discuss the pedagogy of each lesson and how it can best be taught to a group of young people in different settings. There will also be opportunities to work with other participants guiding them, and being guided by them, in the main mindfulness practices from the lessons. Please note: This course does not qualify those who take part to go on and train others to deliver the curriculum. Nor may they share the teaching resources with others. If your place on a Teach Paws b or Teach .b course is going to be funded by your school or other organisation, we recommend you make this clear to them before enrolling for this course. For further information, please see the Terms and Conditions. Our training is open to school teachers and non-school teachers alike but as with all the main mindfulness programmes, it is expected to be taught only by those who regularly practise mindfulness themselves. Research shows clearly that mindfulness is more effective when taught by those who embody the particular qualities it develops, such as open-minded curiosity, kindliness, acceptance, trust, patience, and non-striving, and who have skills of focusing, and paying and switching attention. View the full course prerequisites before applying. How much does Teach .b cost? This four-day course costs £625 + VAT. As a charity, we are able to offer some free and reduced price places. Click here to find out more. The .b curriculum, as with all the main mindfulness programmes, is expected to be taught only by those who regularly practise mindfulness themselves. Click here to see our formal list of prerequisites for full details. Participants will be taught the lessons in ‘real time’ with opportunities to discuss the pedagogy of each lesson and how it can best be taught to a group of young people in different settings. There will also be opportunities to work with other participants guiding them, and being guided by them, in the main mindfulness practices from the lessons. Do you offer free places on courses? As a charity, we are delighted to be able to offer a number of free and reduced price places on some MiSP training courses to schools who have above average numbers of pupils receiving Free School Meals. For more information about MiSP supported places click here. You must have completed in person a teacher-led, face to face, group-based 8-week secular mindfulness course. The following courses are accepted: .b Foundations, .begin, MBSR, MBCT, Finding Peace in a Frantic World (teacher-led version only), Breathworks, Mindfulness-Based Living Course (MBLC) and MSC (8-week version only and must have read Finding Peace in a Frantic World). Your course should have run for a minimum of 90 minutes per week for a period of 8 weeks. You must be certified by a qualified adult mindfulness teacher that you have completed an 8-week secular mindfulness course with them and give the name of your teacher and the date of the course. This training forms an essential foundation and experiential understanding of a range of mindfulness practices that are necessary for teaching .b, and it is assumed that you have engaged in these practises extensively before attending a Teach .b course. If, due to exceptional circumstances, you would like us to consider an alternative training pathway to those listed above, please contact enquiries@mindfulnessinschools.org. Please note that we are unable to hold places until an application form is received. The 8-week .b Foundations course is not available as a public course. .b Foundations is designed to be delivered ‘on site’ in schools for school staff. For more information on how to bring an 8-week .b Foundation to your school or institution click here. To find further-approved 8-week courses near you, please go to the UK Network for Mindfulness-Based Teacher Training Organisations Listing. Experience of working or volunteering with groups of children aged 11-18 years old is essential to .b teachers as Teach .b is not a course which teaches the classroom teaching and management skills needed when working with groups of young people. To ensure there is time to continue to explore and deepen the practices you have learned on your 8 week mindfulness course, we require at least 2-3 months’ embedding period (depending on previous mindfulness experience) between the completion of your 8-week course and starting a Train to Teach .b or .b course. However, you can apply to attend the Teach .b or .b course once you reach the end of your 8-week course, provided you commit to ongoing regular personal practice. We would expect this personal practice to involve a range of practices, including the formal practices explored as part of an 8-week secular mindfulness course, such as Breath and Body, Sounds and Thoughts, Turning Towards Difficulty, Body Scan, Gratitude and Compassion practices. While shorter practices built into your day such as mindful eating, walking and breath awareness also form an important part of your deepening mindful awareness, we ask that you aim for a daily formal practice where possible for 20 consecutive minutes per day for the reasons outlined in 3. below. For example, you may choose to focus in on body scan practices for one week, then explore other formal practices in subsequent weeks such as body and breath, sounds and thoughts or other silent practices. While it is important that you find practices that works for you, it is also important that you investigate and try the practices we list above. This allows you to develop both a broad and deep, experiential understanding of mindfulness practices. It will also form the foundation of your understanding and experience when it comes to leading a range of practices as part of the .b curriculum. i) The key ideas and practices that underlie the most well-respected and widely researched 8-week adult mindfulness courses such as MBSR and MBCT provide the scaffolding that underlies both the Paws b and .b curricula. Before training to teach Paws b or .b to young people, it is assumed that those who attend our teacher training courses have a well-embedded experiential understanding of the key practices involved in these adult 8-week courses. This will then support you when leading young people in the range of practices explored in .b / Paws b, and allow you to deal more skilfully with any questions or responses that arise out of them. ii) This period of 2-3 months embedding helps to stabilise and deepen your practice, which leads to a level of familiarity with the subtle workings of your mind. This in turn strengthens your capacity to model mindfulness in holding the experience of others, and to respond skilfully if difficult situations arise for young people in the classroom. Can I apply before I have completed 2-3 months of practice? Whilst we require a minimum of 2-3 months practice from the end of your 8-week course, you may submit an application form as you reach the end of your 8-week course to help you plan ahead and find a course location to suit you. This is with the understanding that you will maintain your practice. Please note: We would also like to encourage applicants to attend regular mindfulness practice days to deepen their understanding of mindfulness and read Finding Peace in a Frantic World (Mark Williams) and either Full Catastrophe Living or Wherever You Go, There You Are (Jon Kabat-Zinn). The Teach .b course involves 4 days’ intensive training. Over the 4 days, participants will be taught the lessons in ‘real time’ by experienced MiSP trainers. There will then be opportunities to discuss the pedagogy of each lesson and how it can best be taught to a group of young people in different settings. There will also be opportunities to work with other participants guiding them, and being guided by them, in the main mindfulness practices from the lessons. Each day begins and ends with a longer formal mindfulness practice to help support you in further developing your own mindfulness experience. At the end of the course, participants will hopefully feel nourished, confident and ready to teach the lessons to young people. They will also be part of a network of .b teachers, supported by Mindfulness in Schools Project and will leave with access to all the materials they need to teach the .b course in the classroom. Full participation in all aspects of the course will allow you to leave feeling confident in the .b course and in your ability to teach it to young people. In very exceptional circumstances a trainer may have concerns about a participant’s engagement in or readiness to go on to teach the .b course to young people. In this case, the trainer will discuss this with the participant and other members of the training team with a final decision about whether or not the participant should be certified as a trained .b teacher left in the hands of the Lead Trainer. Full attendance on all 4 days’ training (including formal practices at the beginning and end of each day) is required for full certification and access to teacher materials as a .b teacher. While we appreciate that unavoidable situations might occur resulting in a participant missing a part of a training course, e.g. serious injury or a family member being taken ill, the decision as to whether or not the participant is then allowed to continue with the course will be at the trainer’s discretion. If a whole day or more is missed, the participant will be asked to attend the equivalent day(s) in question on a future Teach .b training course and will incur an additional fee. NB Applicants from outside of the UK must: Meet the above prerequisites and be able to speak and understand English to an Upper Intermediate Level, i.e. be able to interact fluently with native speakers, communicate effectively and understand everyday language. Being a .b teacher is not just about teaching mindfulness. If mindfulness is to become an established part of the education of children and young people, it is vital that the highest standards of professionalism and evidence-based integrity are maintained. 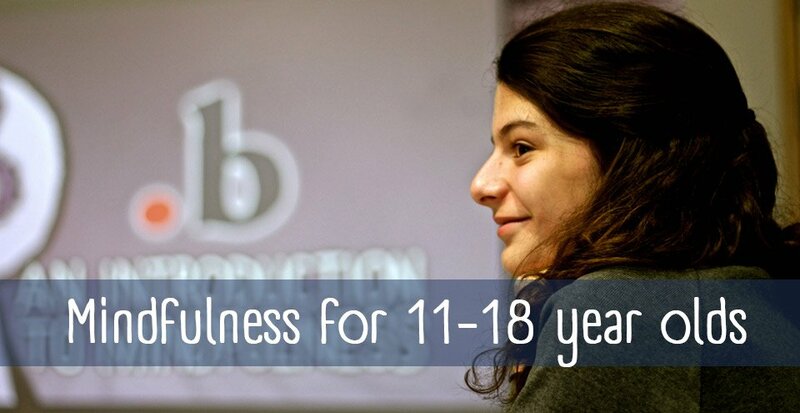 We believe that this is in the interests of all those teaching mindfulness and the young people learning it. We ask that anyone applying to train to teach .b commits to the following and agrees to continue to adhere to these standards on an ongoing basis. Willingness to inform and include staff and school senior leadership in the mindfulness work in the school in which you are teaching.